Hi, Friends! Today I wanted to share a bit of my outdoor decor. This potting bench was made from an old door, and I’ve had it for about four years now. It is outdoors all year round, but it has held up pretty well since it gets some protection sitting right next to the house. 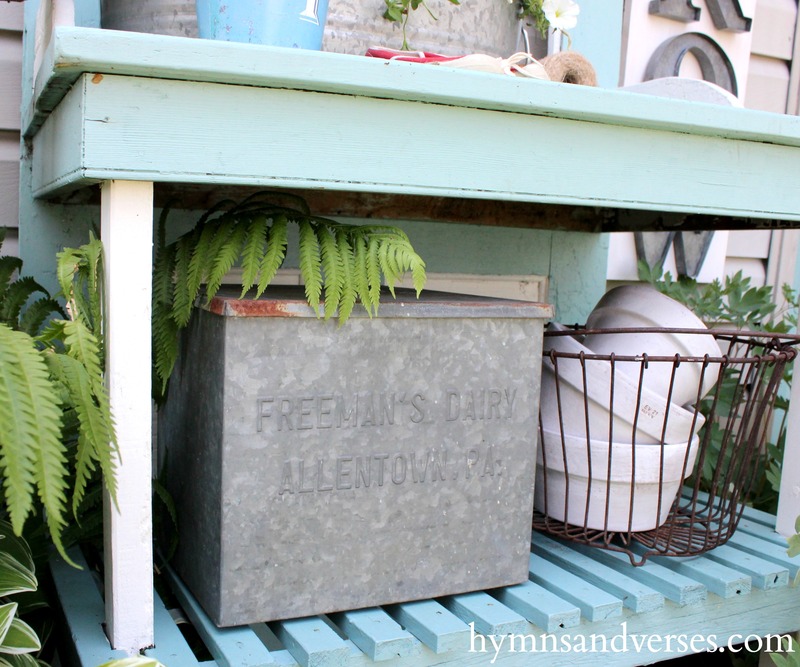 When I first purchased the potting bench, it was painted with milk paint. Last year the color was almost worn away, so I painted it the same color as my front and back doors – Benjamin Moore Mill Springs Blue. Even though a piece like this is meant to be useful, I also like to add some fun accessories to dress it up – when it’s not covered with dirt! I made the red and white plaid fabric pennant banner. It has held up well, even to the sun and rain! 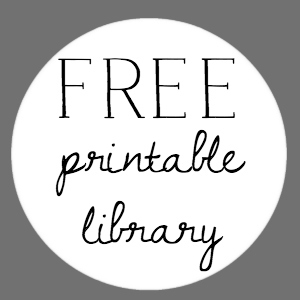 I shared a tutorial showing you how to make your own fabric banner that won’t fray in a previous post. You can find it HERE. It also includes a templates for two different styles of pennants for your banner. 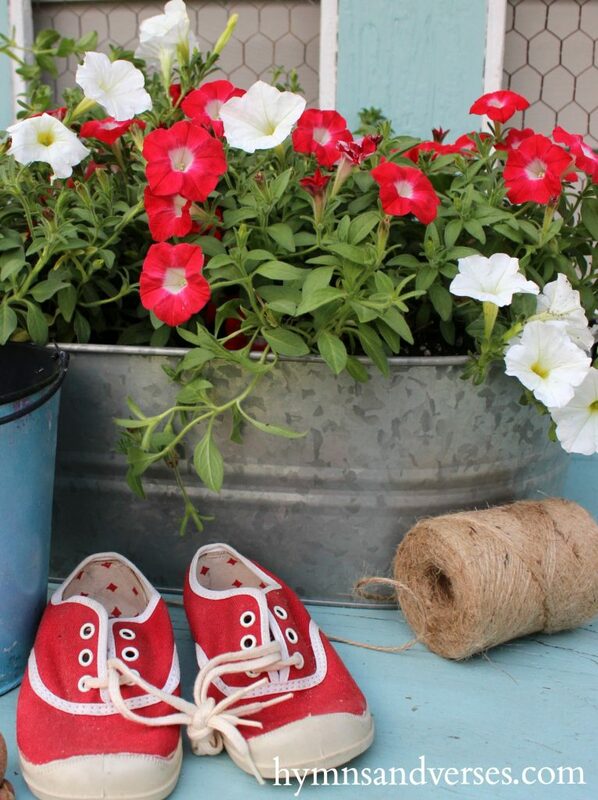 Last summer I found these tiny, red sneaks at a local antique mall; and I love them! Sometimes it’s the little details that make me happy!!! 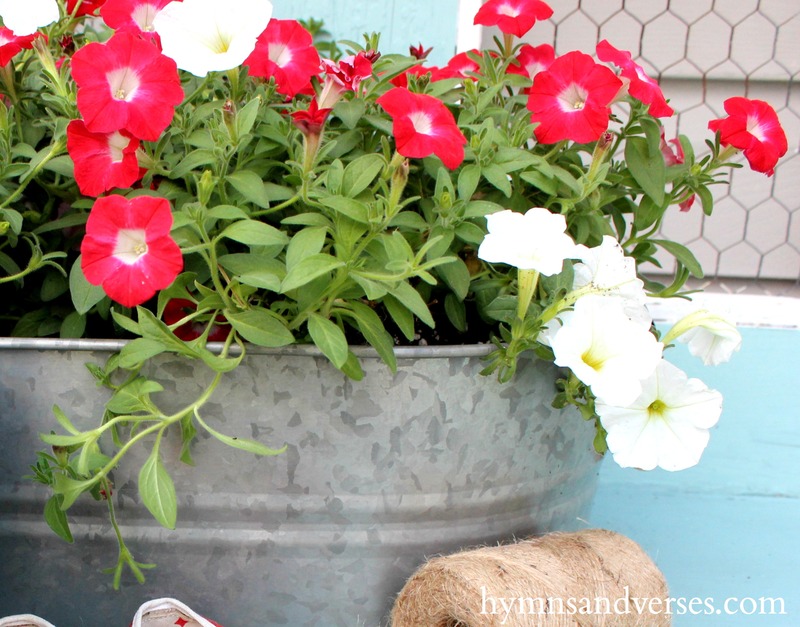 This galvanized container is filled with trailing mini red and white petunias. 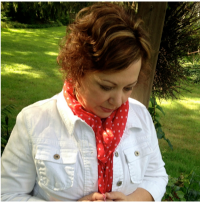 This year I’m having a real fondness for this color combo – red, white, and aqua! Right beside the potting bench is this chippy birdhouse that I attached to an old spindle. 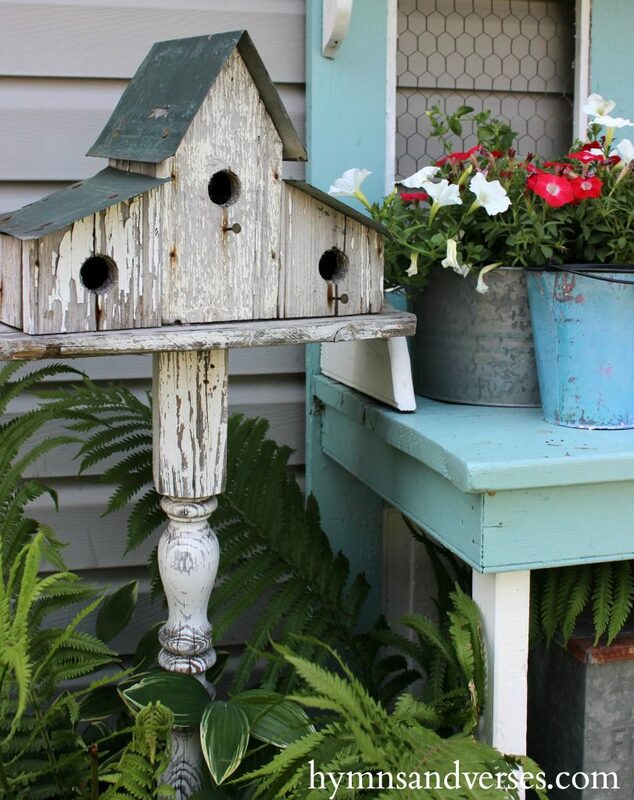 The birdhouse was built by the same local craftsman who made the potting bench for me. 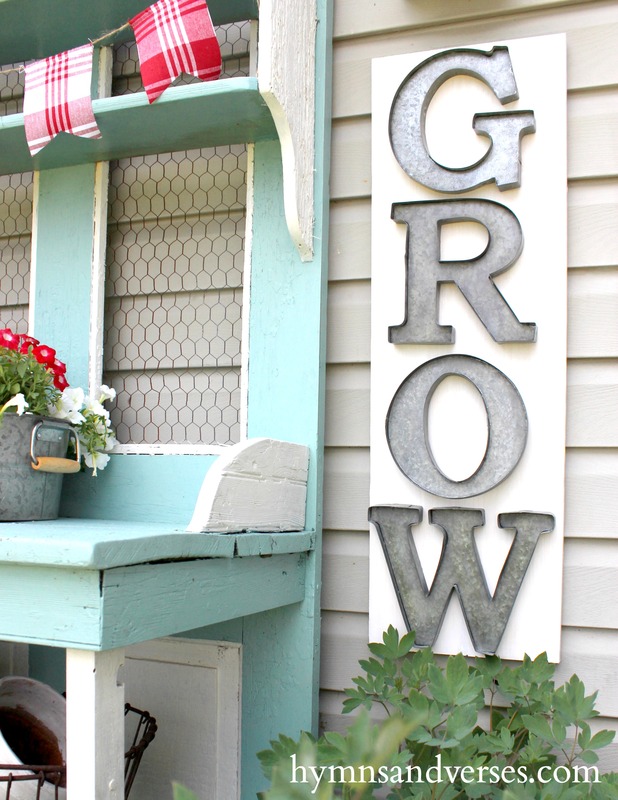 I made this simple “Grow” sign using galvanized letters that I found at a local shop. I attached the letters to a piece of painted wood with E6000 Adhesive. This sign was so easy to make and I love how it fills up this space beside the potting bench. I store my garden gloves and hand tools in this vintage milk box. 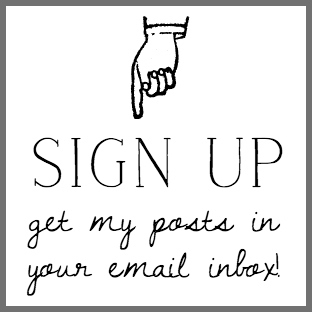 I got this tip from my blogging friend, Yvonne of Stone Gable blog. She is so clever! This time of year, I also like to use my potting bench as an extra space for outdoor entertaining. It’s perfect as a beverage station for an outdoor party or picnic. 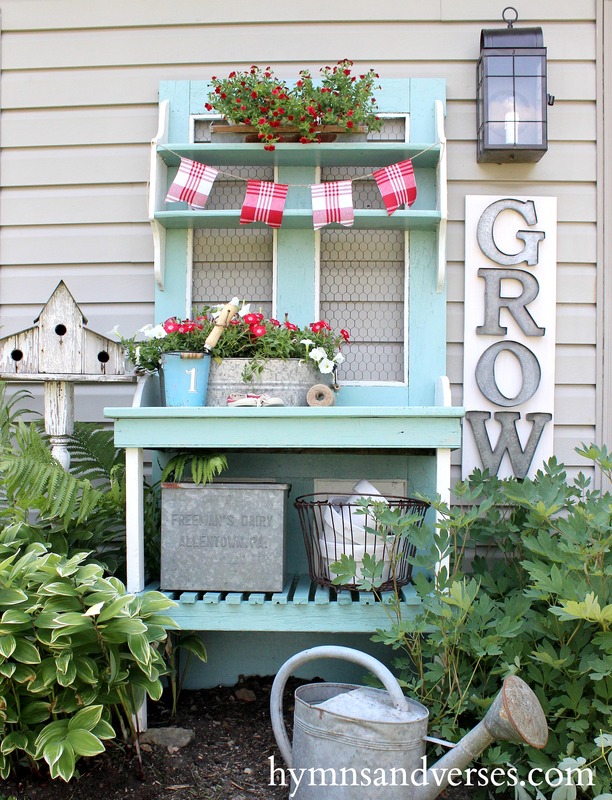 Do you have a potting bench at your home? 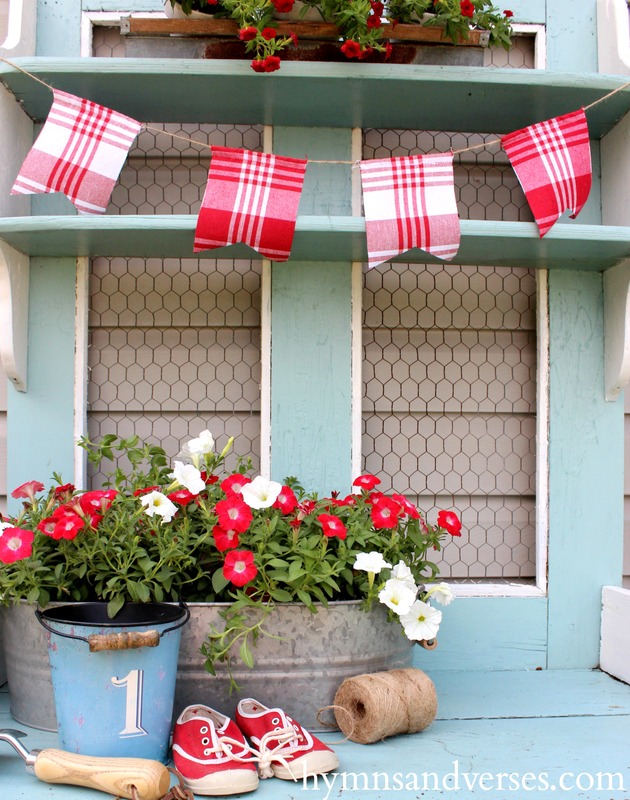 Do you decorate your outdoor spaces? 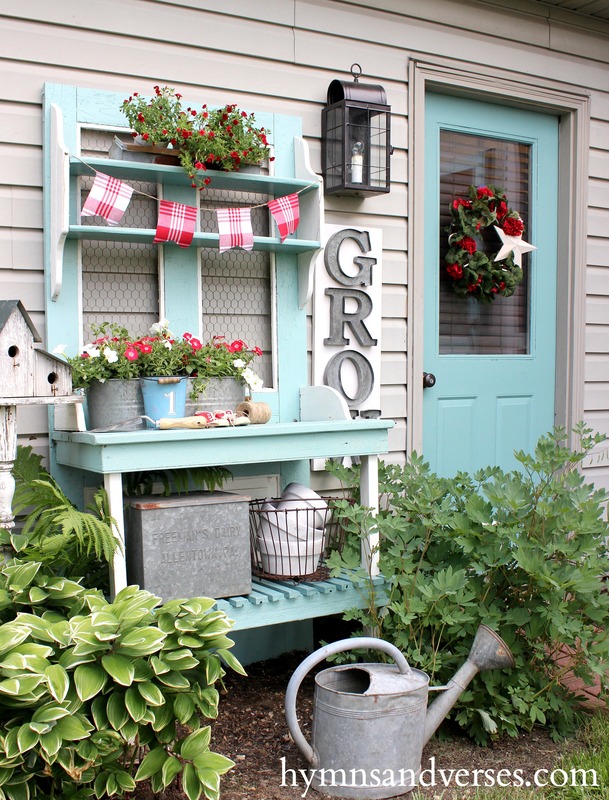 Hi Doreen – I just love your potting bench….especially the Grow sign and those cute little red shoes!!! Do you leave it out during the winter too? Your potting bench and the surrounding area are lovely. ps. found you over at wow linky party @ savvy southern style. Thanks so very much, Maryjo! I’m so glad you hopped over from Kim’s party!